White Water River Tubing, run the rapids. Descend the natural water slides through a wild river canyon in the Cairngorms National Park. Descend through the white water gorges. 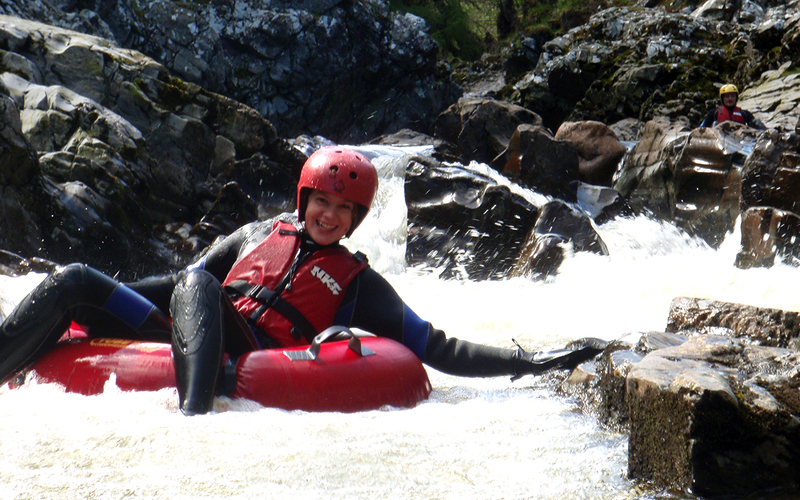 The White Water River Tubing is located only 10minutes from our Aviemore changing room. Using specially designed White Water River Tubes. Hang on tight to avoid flipping, though you might want to try flipping for fun! What is White Water River Tubing? 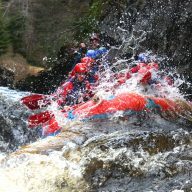 White Water River Tubing is best described as a cross between White Water Rafting and Canyoning. Now our most popular activity, everyone loves White Water Tubing. Natural water slides, fast white water gorges, jumping into deep and safe plunge pools. The ultimate group white water adventure activity, river tubing is closer to the action than white water rafting. 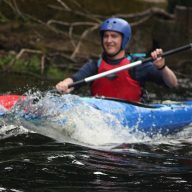 Sit back and bounce down the rapids, or take a bit more control to hit the best routes. 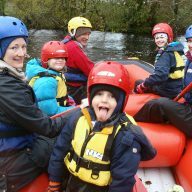 White Water River Tubing is raved about by our customers on trip advisor, from adventure seeking families, stag and hen dos, company team building events to adventure travel tourists from around the world. Adventure White Water River Tubing is the thing you’ll be talking about for years to come. People often tell us it was the highlight of their trip to Scotland. It all happens here in the beautiful Cairngorms National Park, close to our heated Aviemore changing rooms. For families with younger kids under 12 who still want white water excitement, check out or regular River Tubing. 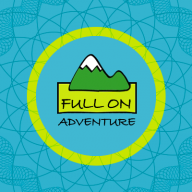 Strictly for adventure seeking groups of adults or those special families who are ready for adventure! Every day throughout the summer. We dont normally run session in the winter months November to end of March. April is subject to prevailing weather. 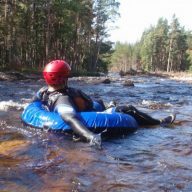 The main season is May to end of Oct. We do have the best rivers in Scotland for River tubing and White Water Adventure Tubing.